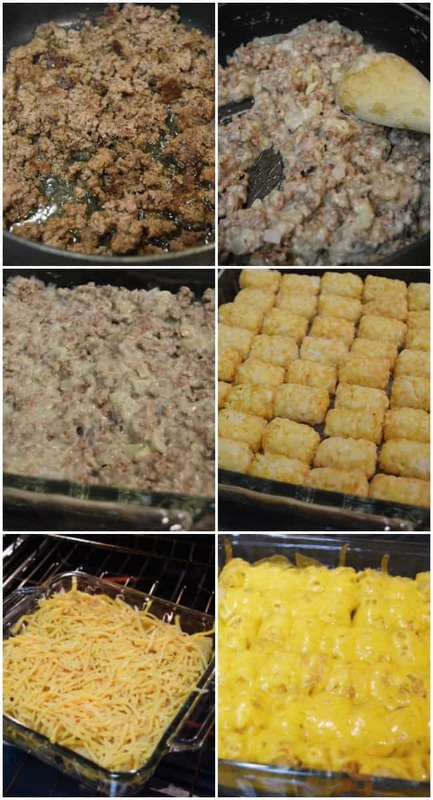 This tater tot casserole recipe is mouth-watering good. All you need is 5 simple ingredients to get started. The cream of mushroom soup gives it that creamy goodness. So good you may want to make a double batch of leftovers the next day. 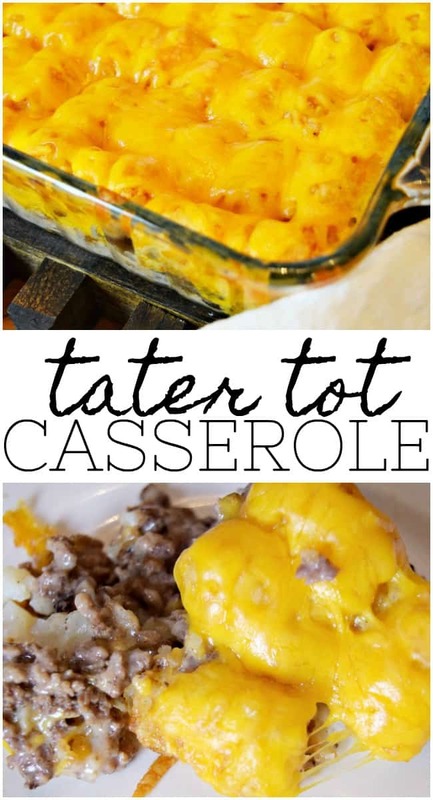 I promise you the entire family is going to love this tater tot casserole recipe. The perfect comfort food for a weekend or even a weekday night too. Brown your pound of ground beef and drain. In a separate bowl mix together your beef, mushroom soup, and onion. Spread the mixture into the bottom of an 8×8 casserole dish, evenly layered. Place a layer of tater tots covering the top. Bake at 350 degrees until tater tots start to brown. Add a layer of cheese and finish baking until cheese melts. This dish makes enough for a family of 3, with just a bit leftover. 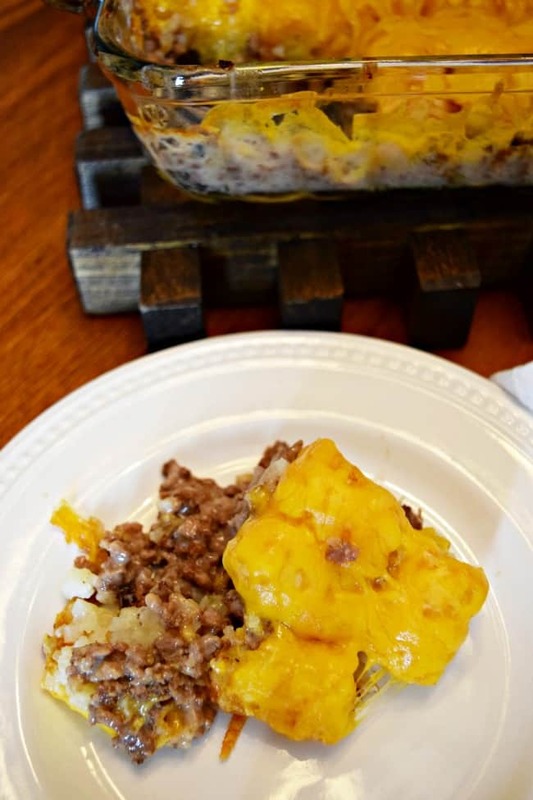 If you are making for a larger family or guest I would recommend doubling the recipe and using a 9×13 inch casserole dish. Spread the mixture into the bottom of an 8x8 casserole dish, evenly layered. This dish makes enough for a family of 3, with just a bit leftover. 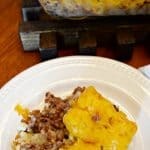 If you are making for a larger family or guest I would recommend doubling the recipe and using a 9x13 inch casserole dish. Want to change it up? You can turn this dish into a Chicken Tater Tot Casserole Recipe. All you will need to do is change out the ground beef for cooked and shredded chicken and the cream of mushroom soup for cream of chicken soup. If you prefer you can also add vegetables in either dish, such a peas or corn. There are many ways you can tweak this dish to suit your families needs.